What happens at your laser eye surgery consultation? Having had your consultation, read our patient info literature and visited our comprehensive website, you have now made your decision to go ahead with laser eye surgery. Today, after your laser eye surgery treatment lasting only around fifteen minutes, you will experience a new lease of life free of glasses or contact lenses. 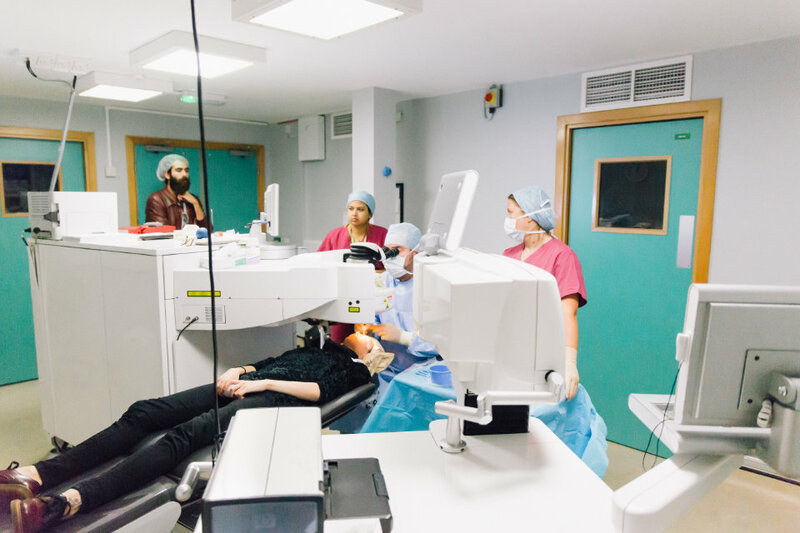 Compared to your consultation your treatment will seem very quick – we spend a lot of time prior to your treatment day examining your eyes in detail and making sure you are a candidate for laser eye surgery. Laser eye surgery is a very quick procedure and is over within minutes. 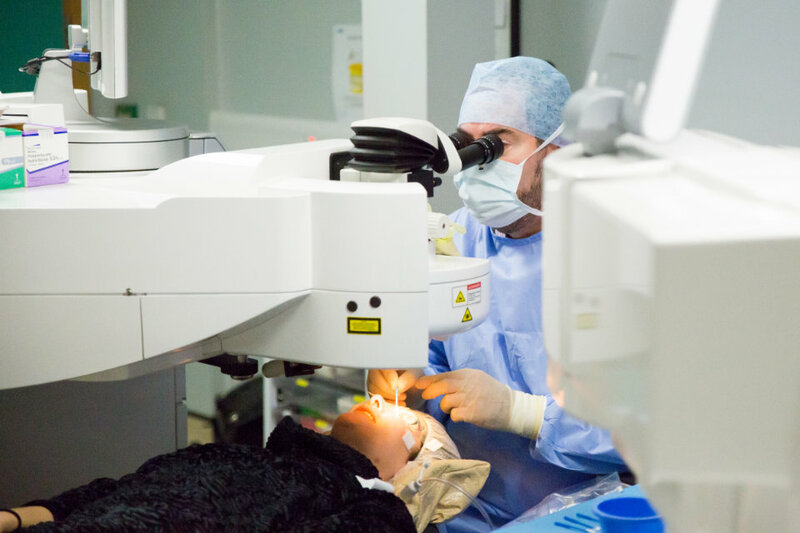 You may have waited months or even years before deciding on laser eye surgery, but the procedure itself is extremely streamlined, lasting around 15 minutes only. Before you know it you will be looking at the clock on the wall amazed that you are now able to tell the time unaided. Minutes away from her procedure this is the last time Amy will wear glasses for distance vision! On your laser eye treatment day it is perfectly normal for you to feel slightly nervous or anxious – patients are often accompanied by a friend or family member for some moral support. When you arrive, our friendly team will make you feel comfortable and reassured. You will have a few forms to sign and then one of the nurses will sit with you and explain our comprehensive aftercare program. This includes advice on how to use the post-operative eyedrops and how best to care for your eyes after your laser eye surgery treatment. With laser eye surgery both eyes are treated on the same day – this is known as bilateral (simultaneous) treatment. 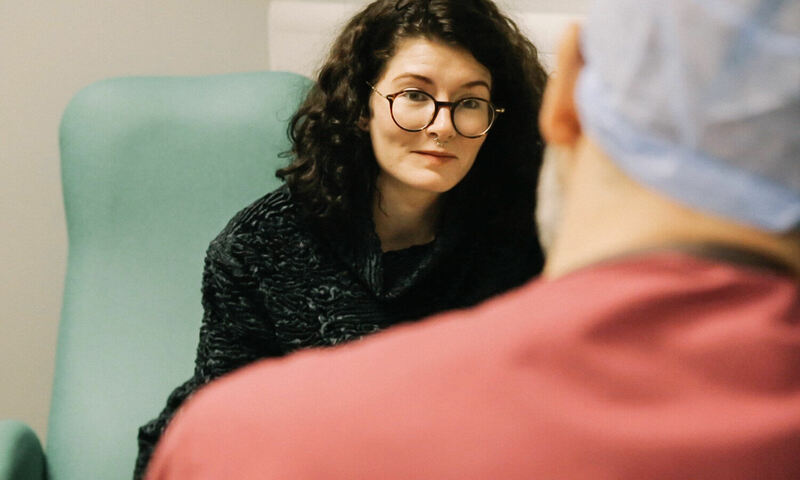 You will, of course, see your surgeon David Gartry before your treatment and have an opportunity to ask him any final questions to put your mind at rest. Some simple additional checks are then carried out and you will be taken through to the treatment room. Once inside the treatment room (this is a sterile operating theatre environment, with conditioned, filtered air under positive pressure) some local anaesthetic eye-drops are instilled. These work almost instantaneously and reduce the urge to blink during the procedure. You will then lie down on a flat bed which moves under the laser. There are always three fully-trained nurses assisting with the surgery and to instruct or advise you as necessary. If you are having LASEK treatment, a dilute solution of alcohol is applied to the surface of each eye to soften the protective outer layer (known as epithelium). If you are having LASIK you are then moved under the state of the art AMO iFS Advanced Femtosecond Laser. This 5th generation iFS laser provides unprecedented accuracy and control – it is used to create the corneal flap in preparation for the second part of the treatment. You’ll hear very little noise as the laser does it’s work – it’s almost silent – and the first part of the treatment is over within minutes. Once the flap is created the AMO STAR S4 IR Excimer Laser then corrects your vision in the second stage of the treatment. This Advanced CustomVue® laser has been programmed with your unique eye measurements and data to ensure the best possible outcome. David Gartry and his team will talk you through the procedure and make sure it is as comfortable as possible. During this final part of the procedure the eyelids and eyelashes are gently covered with strips of soft sterile plastic. The second eye is gently covered with a patch to prevent any distractions whilst the first eye is being treated. Many people ask what you ‘see’ whilst this is going on – to put simply – you are asked to stare at a bright red flashing light. You can blink normally and are asked to remain still. Our tracking system monitors the position of your eye thousands of times a second in order to compensate for any movement. During the second part of the procedure you will hear a repetitive tapping sound which is perfectly normal. Once complete the LASIK flap is repositioned (or the epithelium in the case of a LASEK treatment). You will be asked to continue staring at the red light for just one minute whilst the flap or epithelium settles back in place. Both eyes are treated and the entire procedure lasts around 15 minutes. Once everything is complete you are then asked to sit up – patients often are able to immediately tell the time by looking at the clock on the wall – previously something that would have appeared blurry without glasses or contact lenses.You will then be taken to a recovery suite where you can relax with a hot drink before going home to rest. Due to drops used and your eyes adjusting to the treatment vision is often a little blurry immediately after your laser eye surgery.